Lisa and I were talking on the way home from Jordanelle last week about night swims. She said she had never done one, so I knew we needed to get one together. After posting on Facebook, we decided to go Friday night. Before I get into how our swim went, let me just offer some tips and precautions about swimming at night. 1) NEVER do it alone. You really need to have someone in a kayak with you to make sure you don't get lost. 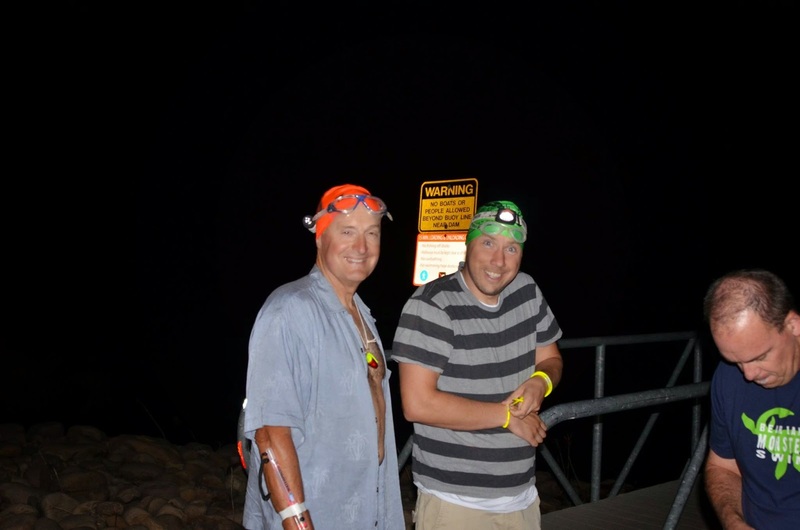 Your kayaker should wear glow sticks or other lights so they are easy to see. You can also attach glow sticks to the kayak. 2) If you are swimming in a group, adjust your speed so that you can all stay together, or agree to re-group at regular, short intervals. 3) Wear some glow sticks or other lights so you know where the other swimmers are. 4) Leave you tinted goggles at home. Go for the clear lenses. 5) When the sun isn't out, the air and water feel colder. Be prepared for it. Now that that's out of the way...on with the story! We met at the PWC ramp at Jordanelle around 10pm. It was already really dark when we got there. After hauling the kayak down the ramp, we broke out the glow sticks. Sarah joked that it looked like we were going to a rave. My new glittery silver speedo looked like a disco ball in the flashing lights, and the others made sure to let me know how ridiculous I looked. Jim, Tim and Kris floated out near the buoys and hung out there. Steve (Sarah's husband who was paddling for us), Lisa, Sarah and I headed out along our normal buoy route. It is a pretty cool thing to see the glowing bracelets of the other swimmers, flashing through the dark around you as you swim. I was wearing a couple bracelets on each wrist and it was cool to see my hand, the water and the bubbles light up with each stroke. Steve did an excellent job directing us. He was wearing a headlamp and was easy to see. He also pointed a light at each buoy as we got close so we knew where it was and didn't run into it. At the end of the buoy line, we floated on our backs and looked at the stars. There were no other lights around and the moon was not out. It was an incredibly beautiful view. We swam back the other way to the opposite end and then back to the ramp. On the way in, Lisa suggested doing backstroke so that we could enjoy the stars again. It worked great until I smacked Sarah in the head. Jim, Tim and Kris were gone by the time we got back. We cleaned up quick and hit the road. We ended up with 1.5 miles in the dark. It would be fun sometime to do a long swim at night and time it so that you finished the swim at sunrise. There were several people who wanted to come, but couldn't make it. I think we are planning to do this again, maybe on the next full moon. Watch the Facebook page for details.